At the start of weaning my tiny babies, I was there, making mountains of organic purees and crinkle cutting mangos. There wouldn’t be any processed foods or chocolate for my two, nope siree. My children wouldn’t be having sweets or chips until they were at least 18.. Oh how times change. Now at 3 and half, they love all of those things I turned my nose up at. How did that happen?! I don’t mind too much really, my feeling is that as long as they have plenty of amazing stuff in their diet, a treat here or there is okay. So, I really try to cram their meals with as many nutrient rich food as possible. 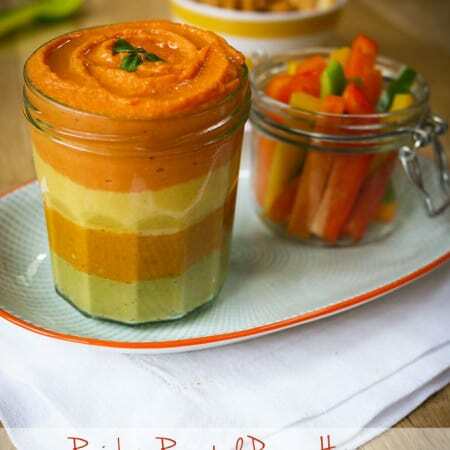 This layered, vegan, rainbow coloured, roasted pepper hummus is the perfect toddler lunch. Naturally brightly coloured, fun to make, fun to eat and of course full of good things. 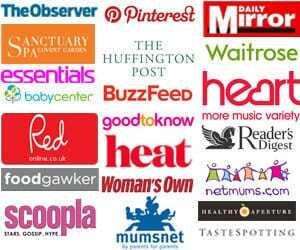 The Colourfultaste campaign got in touch with me and asked me to share with my readers some of the facts about peppers and what a great addition they can make in kids’ diets. Peppers have more than double the amount of vitamin C compared to oranges. Peppers are fat free, sugar free, carb free, gluten free and have hardly any calories. In addition to heaps of vitamin C, peppers also contain vitamins E, B1 and B2. Your body also converts the peppers beta-­carotene into vitamin A. They are a really tasty and easy way to eat lots of nutrients in one burst. You can read more about the nutritional benefit of peppers here: http://www.itspeppertime.co.uk/portfolio-item/packed-with-vitamins-and-minerals/. There’s also a handy vitamin C counter here for common fruits and vegetables: http://www.itspeppertime.co.uk/portfolio-item/nutrition-facts/, compare your favourites and see how peppers measure up. I made this hummus in my beloved Froothie Optimum 9200 blender which whips up the dip in just a few seconds. If you don’t have a power blender, and food processor or hand blender should do the same job. Top tip! When peeling your garlic for this, remove the centre shoot inside the clove. This makes the raw garlic a little more digestible. I like to serve this in small jam jars, just because they are the perfect size and make the dish even more interesting for children. I add mini breadsticks and vegetable sticks for dipping to complete the meal. This recipe makes 6 pots, which is lunch for the 3 of us twice in a week. You can of course reduce the quantities if you won’t use that much. 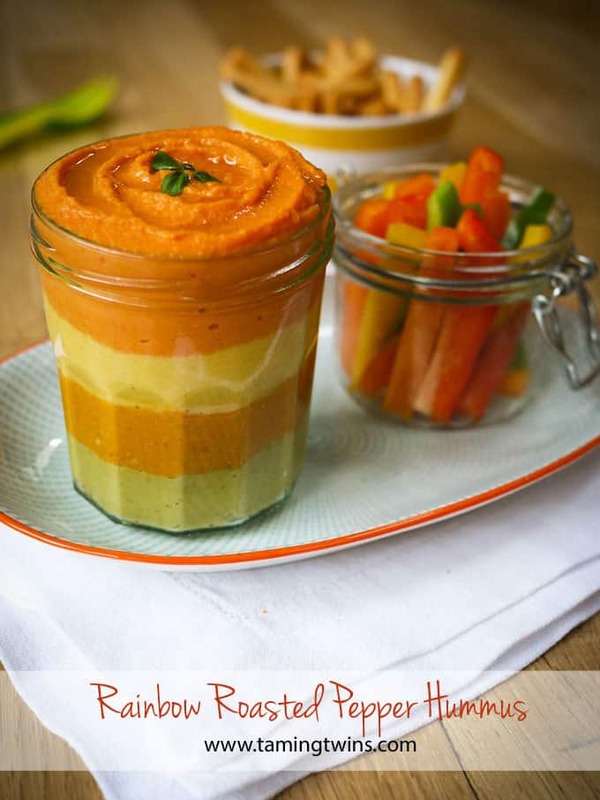 A great alternative to standard hummus by using roasted pepper. Prick each of the peppers with a knife a few times and pop onto a baking tray. Bake in the oven for about 30 minutes, turning halfway through, until the skin is charred and blackened. Remove the peppers from the oven and carefully put them into a large food bag. Seal the top of the bag and leave until cold. Remove the peppers from the bag, pull out the stalk and remove the skin and seeds by rubbing with your fingers. Rinse under the tap if needed. 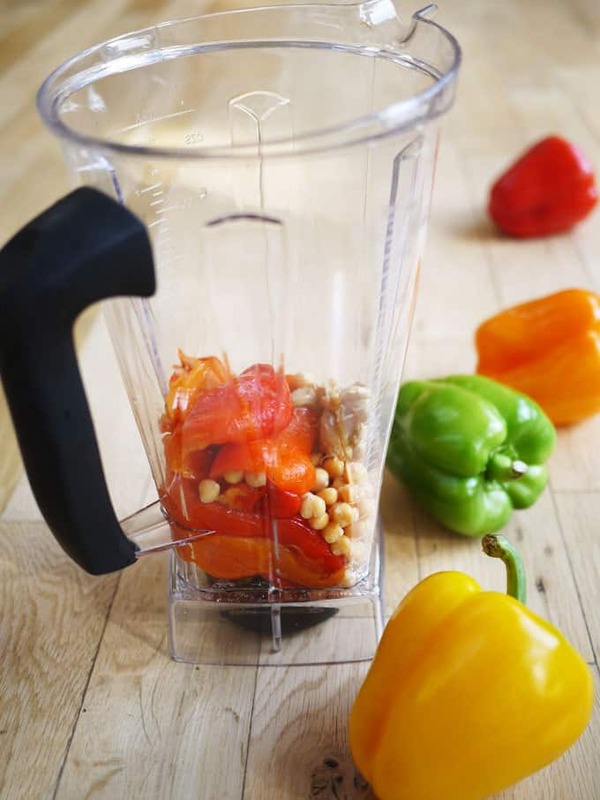 Make the green pepper hummus, by putting the green peppers, half a tin of hummus, 1 tsp tahini, 1 tsp olive oil, a quarter of a clove of garlic and all of the basil and mint into the blender and blitzing until smooth. Spoon the mixture into the base of 6 jam jars. 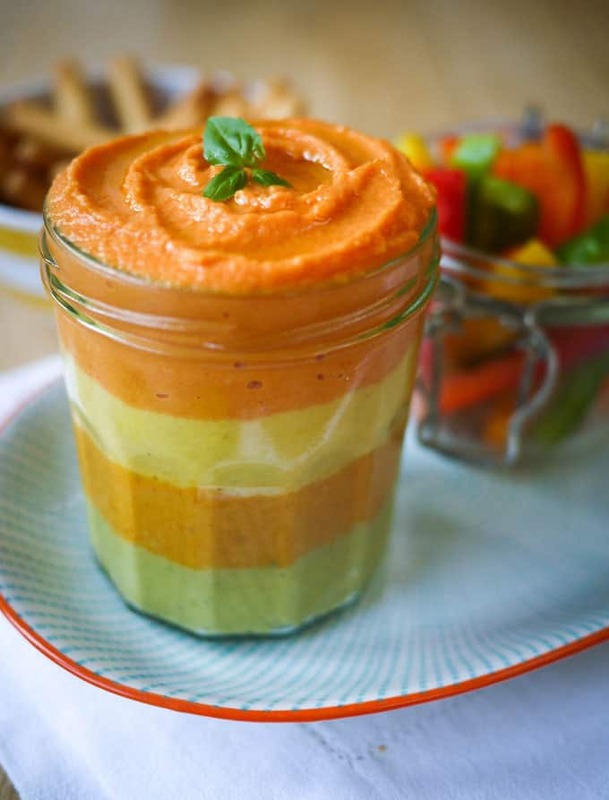 Make the orange pepper hummus, by putting the orange peppers, half a tin of hummus, 1 tsp tahini, 1 tsp olive oil and a quarter of a clove of garlic into the blender and blitzing until smooth. Spoon this as the second layer in the jam jars. 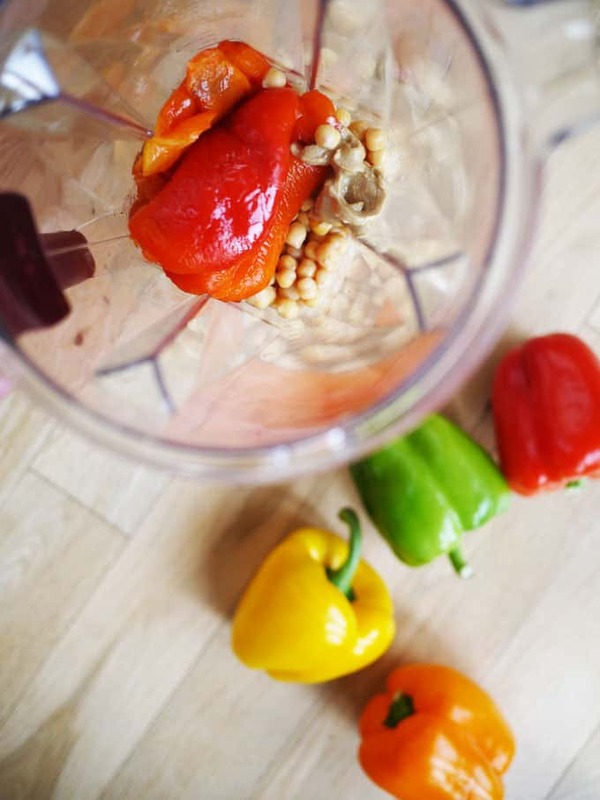 Make the yellow pepper hummus, by putting the yellow peppers, half a tin of hummus, 1 tsp tahini, 1 tsp olive oil and a quarter of a clove of garlic into the blender and blitzing until smooth. Spoon this as the third layer in the jam jars. 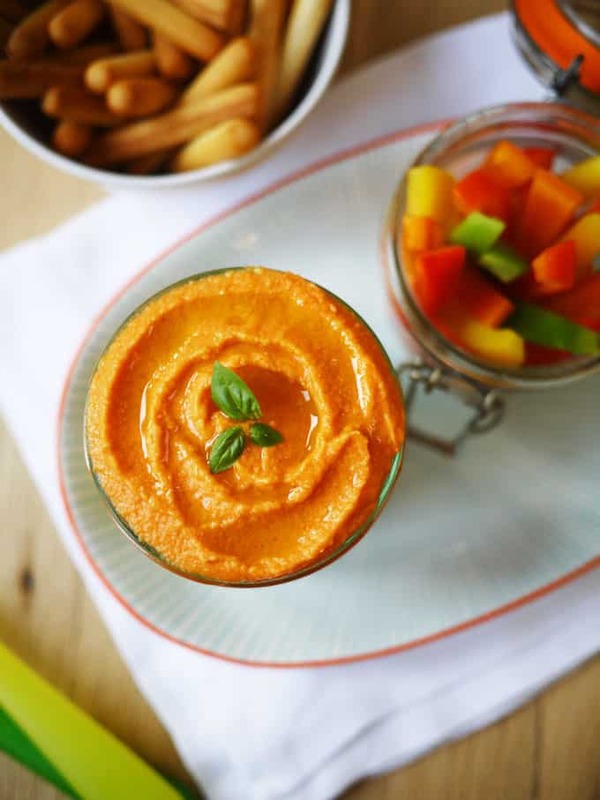 Make the red pepper hummus, by putting the red peppers, half a tin of hummus, 1 tsp tahini, 1 tsp olive oil and a quarter of a clove of garlic and blitzing until smooth. Garnish with a drizzle of oil and some basil, serve with vegetable sticks and bread sticks to dip. What’s your favourite recipe for keeping kids eating healthily? Any tips of tricks for helping fill their diet with good stuff? This post was commissioned by the Colourfultaste campaign. This post contains affiliate links. This looks absolutely delicious! I am in the process of growing my own peppers at the moment, so will be making this when they are ready to harvest! Oh wow that’s amazing! Good luck! Aww, thanks Sarah. Even more reason to get one! These look fab! I’m thinking a little tweaking and the could be properly traffic light coloured. There is no such thing as too much hummus! Lovely lovely recipe. Great recipe. Lovely colours. Normal hummus looks so boring now! This looks so beautifully stunning I just want to get stuck right in. Love the way you’ve layered the different colours. Not just for toddlers I reckon.